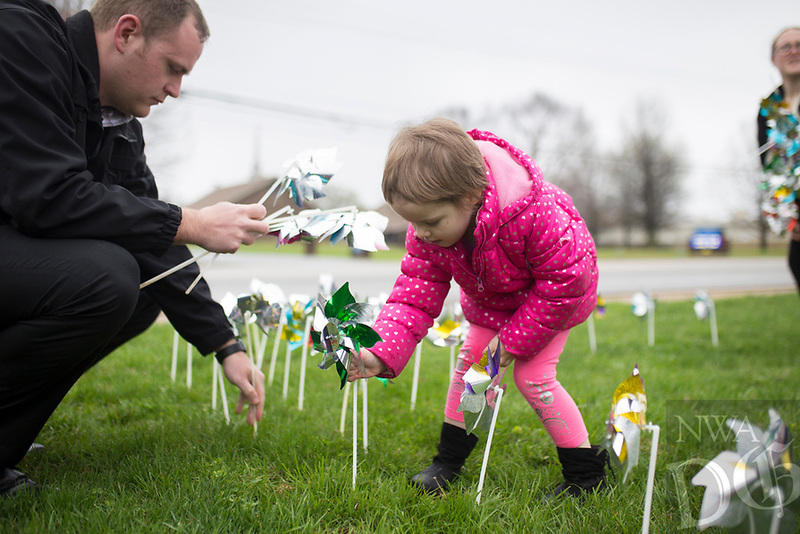 NWA Democrat-Gazette/CHARLIE KAIJO Elizabeth Crouch, 4, (center) places pinwheels on the ground with Det. Adam Corbett (left), Monday, April 2, 2018 at the Bentonville Police Station in Bentonville. The Cherishing Children rally brings the community together to raise awareness with the intent of eliminating child abuse by recognizing members of a multidisciplinary team in their efforts in child abuse investigations. Judge Berry Moehring read a proclamation declaring April as child abuse prevention month in Benton County followed by a dove release to recognize each child who has died in Benton county of child abuse. Afterwards, volunteers went to several locations around Benton County to place pinwheels on the ground for each confirmed child abuse case, a reminder of a child's innocence said Natalie Tibbs, executive director at the Childrenâ€™s Advocacy Center. There were over 25 reports of child abuse in 2017. Nationally, 1 in 4 girls and 1 in 6 boys will experience some form of sexual abuse by age of 18, which doesnâ€™t take into account countless forms of physical abuse and neglect, Tibbs added.